Enjoying the Amazing Jazz Performance at Bromo east Java, Indonesia. 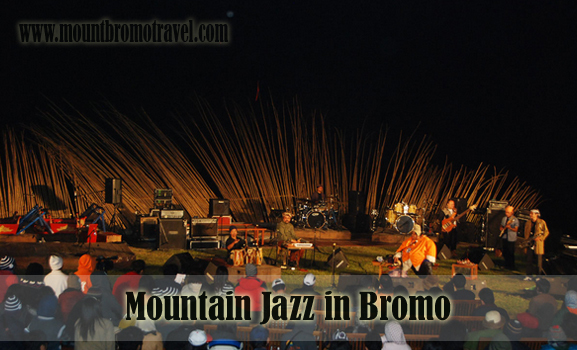 Have you heard about Mountain Jazz in Bromo which has been really popular now? Of course, many of you have heard about that and perhaps it becomes one of the reasons why you are interested in enjoying Bromo and also enjoying the jazz music performance there. Surely, that will be such the great experience you could not miss if you are going to visit Mt. Bromo around June. Surely, if you love nature, jazz, music, and mountain, you have to enjoy this event. There, you will be able enjoying the sensation of a jazz concert outdoor at the mountain. We can imagine how amazing the experience will be. That is a good idea to be well prepared first so that we would not miss anything there including the itinerary, accommodation, transportation, and many other things. That is such a good idea for you to enjoy Bromo as well as Jazz concert. That will be totally that different from enjoying the common concert. We can enjoy the nature, cold, beautiful view, and even the amazing jazz concert there entirely. That will be the worth to try vacation ideas at Bromo. Bromo has a lot of great things to be enjoyed which are completely that fun. That is including the Mountain Jazz in Bromo, where we can enjoy not only the amazing jazz concert from talented musician but also the beautiful view of the mountain there. We can also enjoy the nature directly since it is held outdoor at the mountain. That becomes the reason why his mountain jazz event becomes really amazing and interesting for anyone. This is actually the annual event which is always held at Bromo. You need to know that the jazz music there is commonly the upbeat jazz type, not the classic style jazz. So, that will be so much fun there in the cold of the beautiful mountain. There are some tips which you can simply deal with if you are really interested in enjoying this event. One of the tips is always prepare it well earlier. Since it is such the most awaited jazz concert in country, you have to be ready to book anything earlier, as like for the transportation, accommodation and even the ticket. That is because there will be thousands people who will also struggle to get the ticket and even the accommodation. If you do not want to get bothered or even failed to enjoy that event, you can also find the package of the event. You only need to book it which will get some service, as like ticket of Mountain Jazz in Bromo, accommodation, transportation, and even some fun activities there.